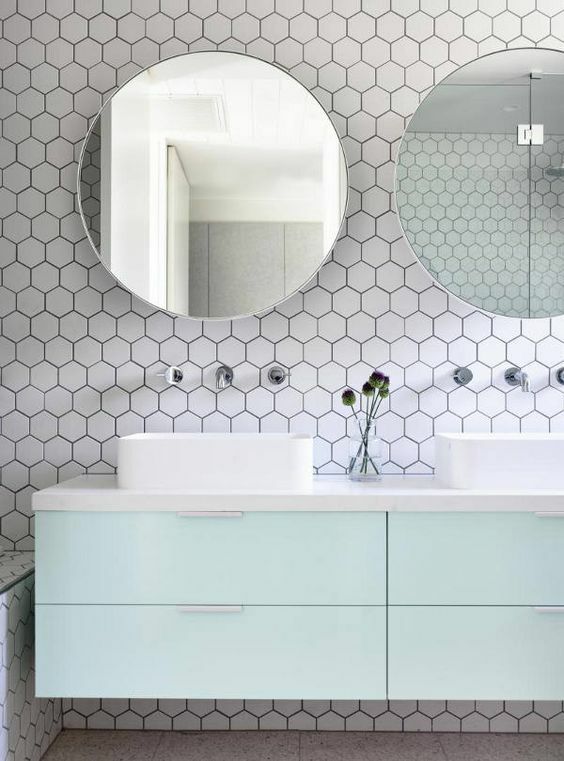 Hexagon or honeycomb tiles are super popular for 0decorating at home now because they are geometric ones, and geo décor is a hot trend. 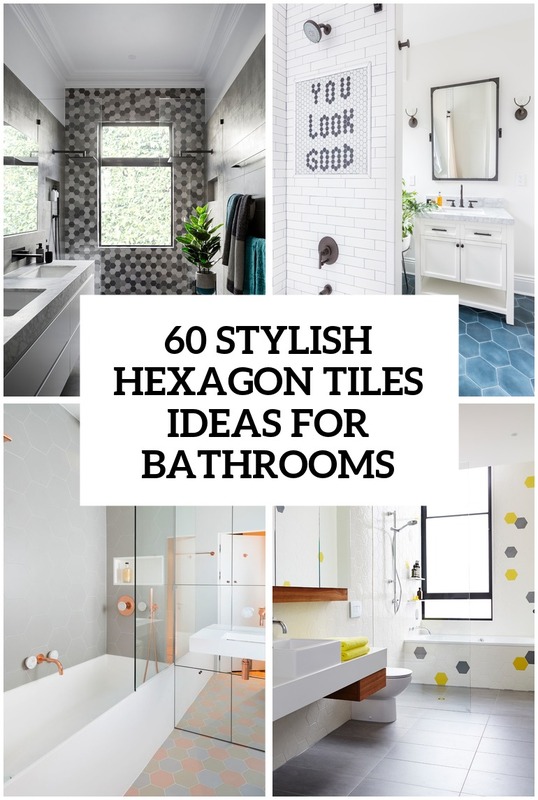 They can be used both in the bathroom and kitchen and fit almost any décor style you choose. 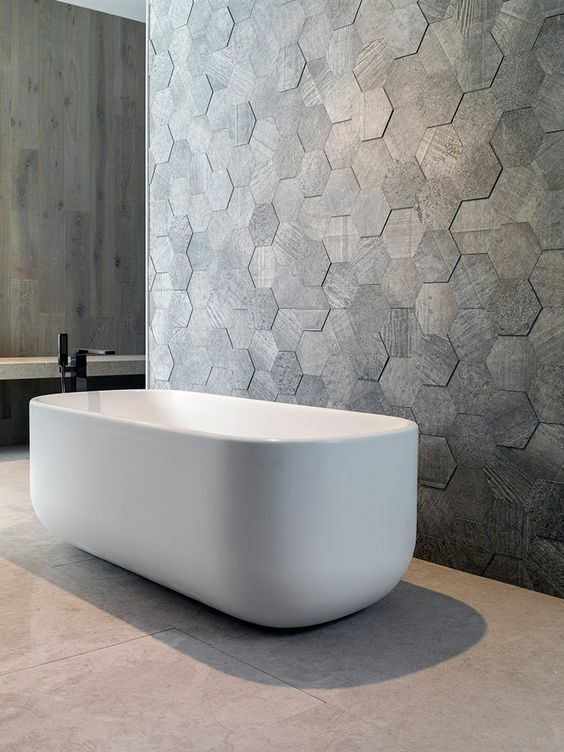 Today we’ll have a look at the gorgeous bathroom hex tiles ideas, best colors, combos and ways to use them. 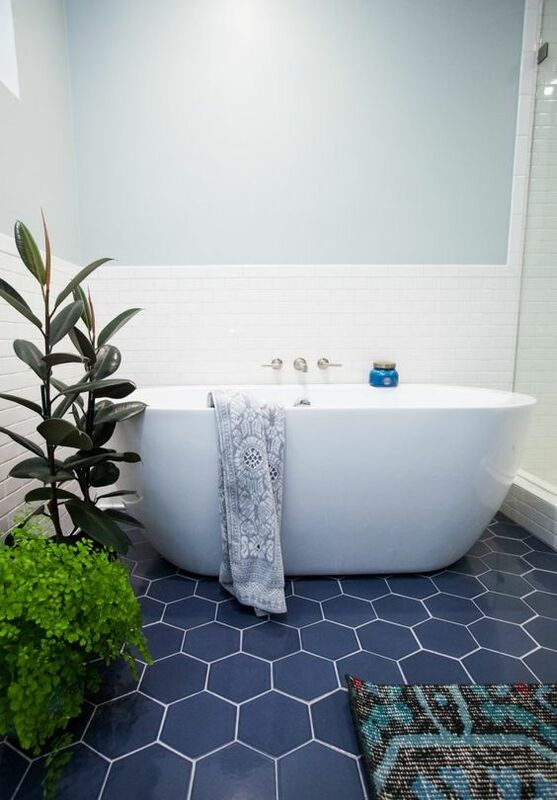 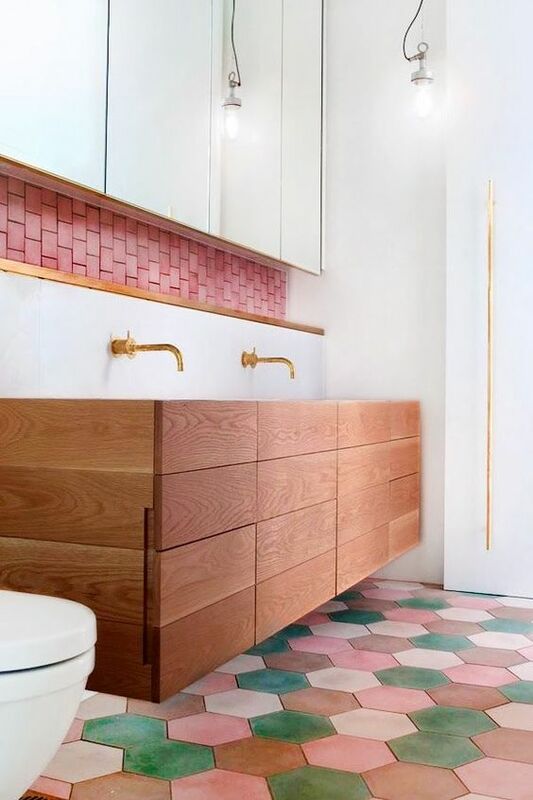 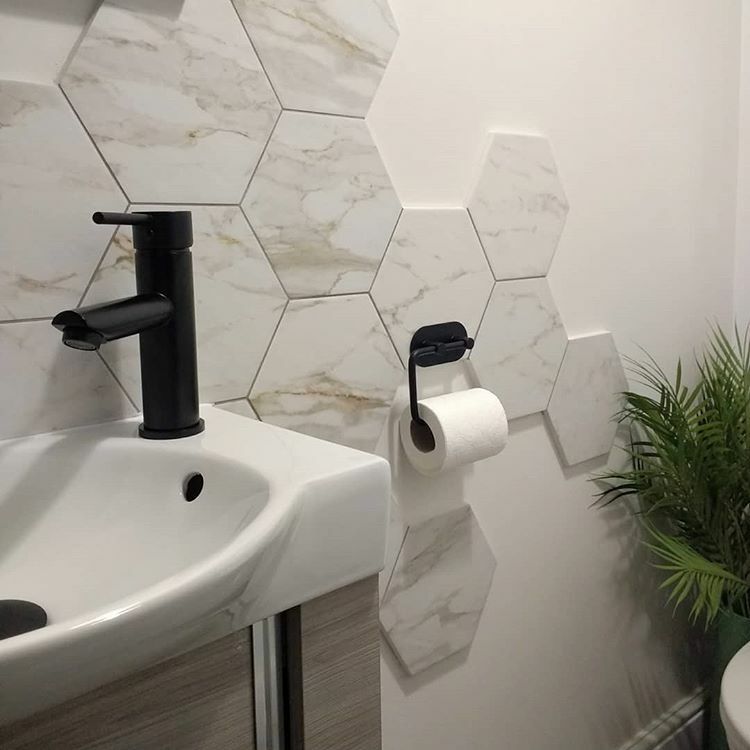 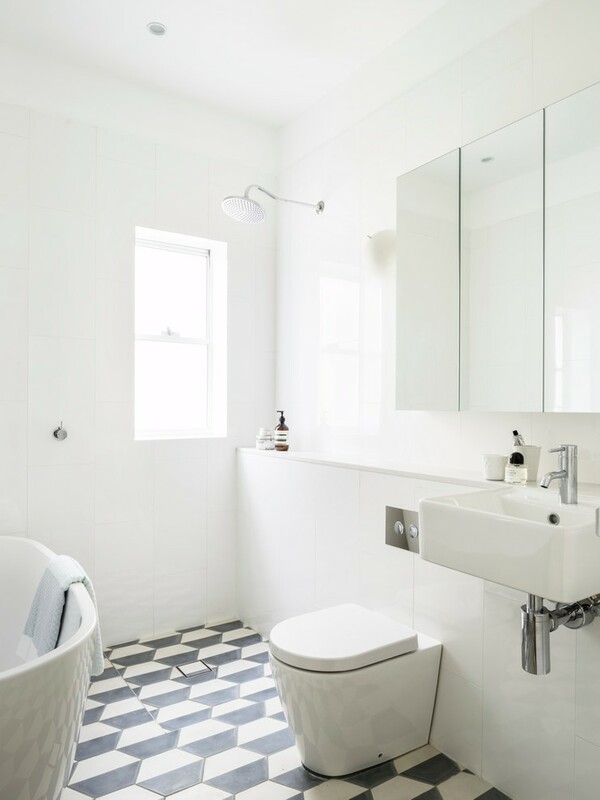 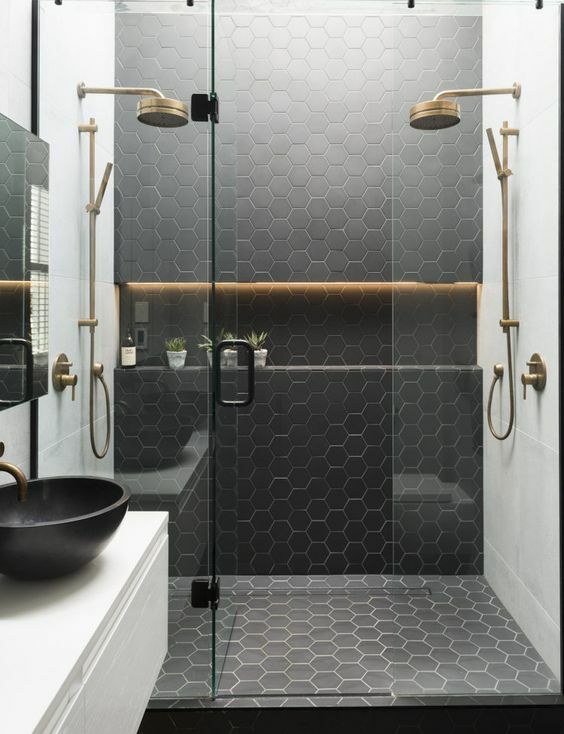 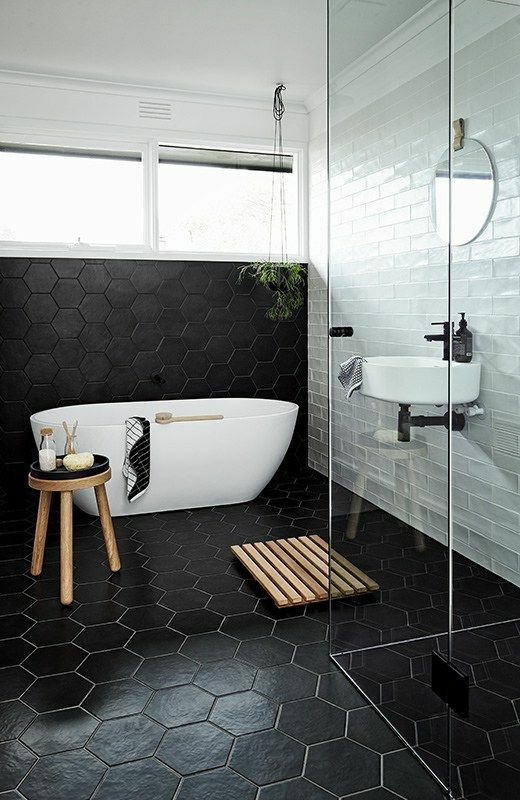 Hexagon tiles are often used for covering bathroom floors because tiles are very durable, water-resistant and hex tiles can easily make a cool statement. 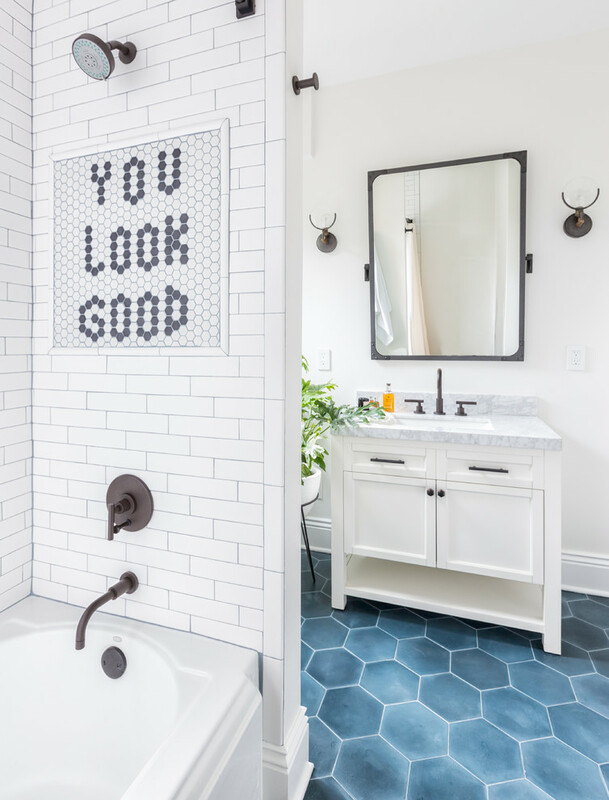 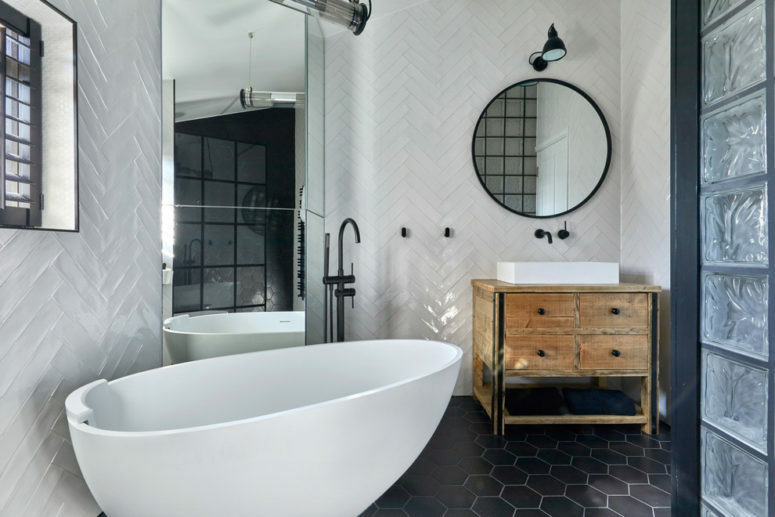 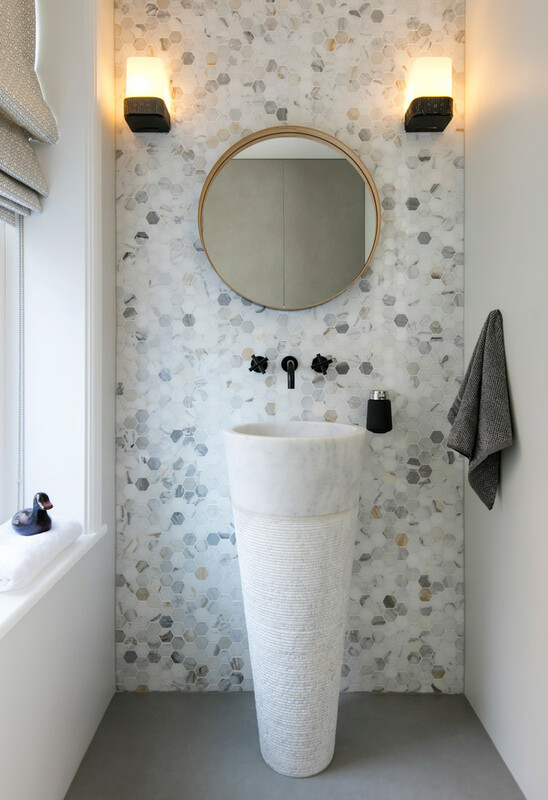 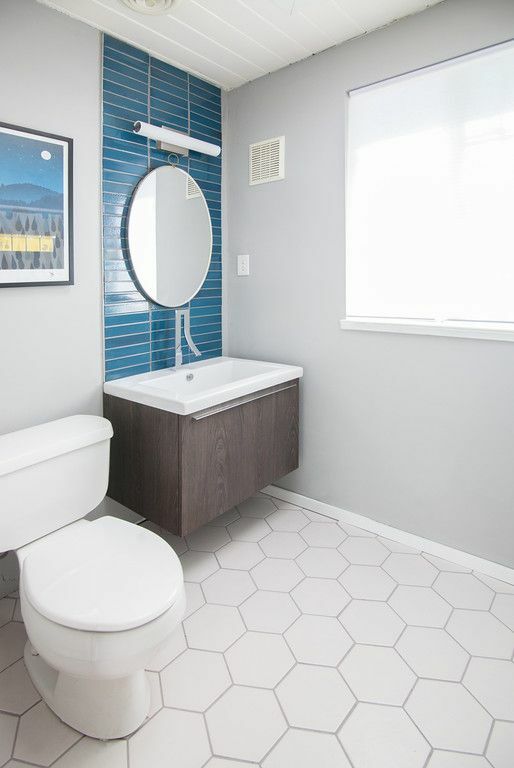 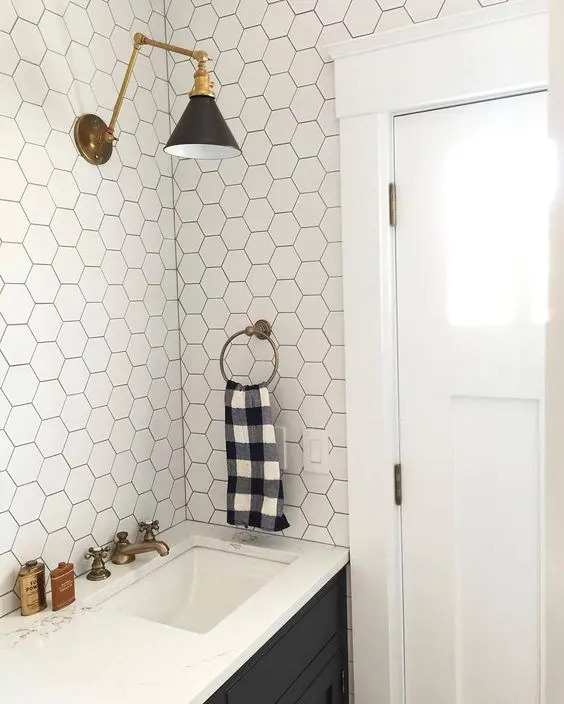 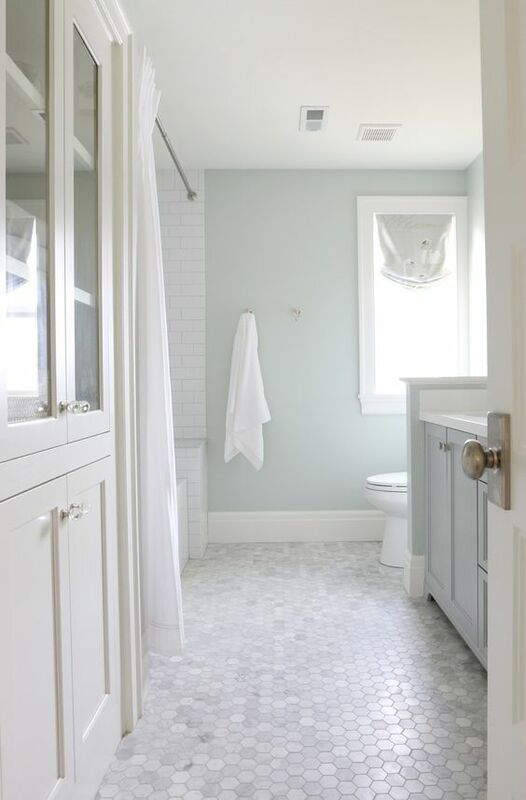 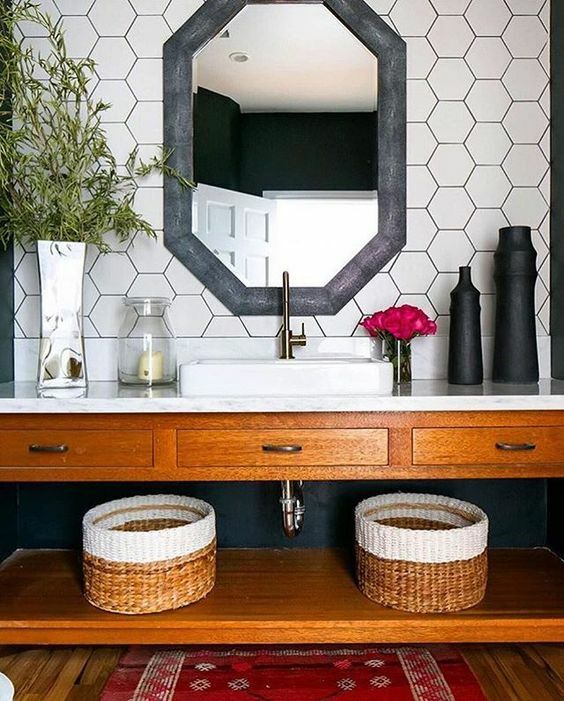 The most popular idea here is to decorate a bathroom in neutral colors and add a contrasting hex tile floor in navy, black, dark grey or any other color, and contrasting grout can help you to highlight the tiles. 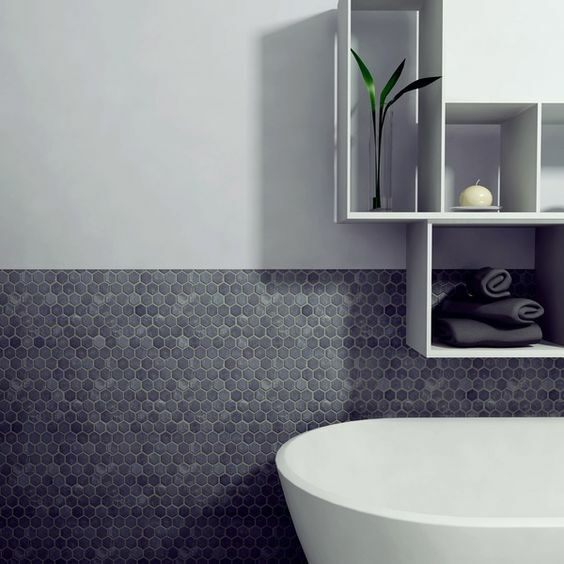 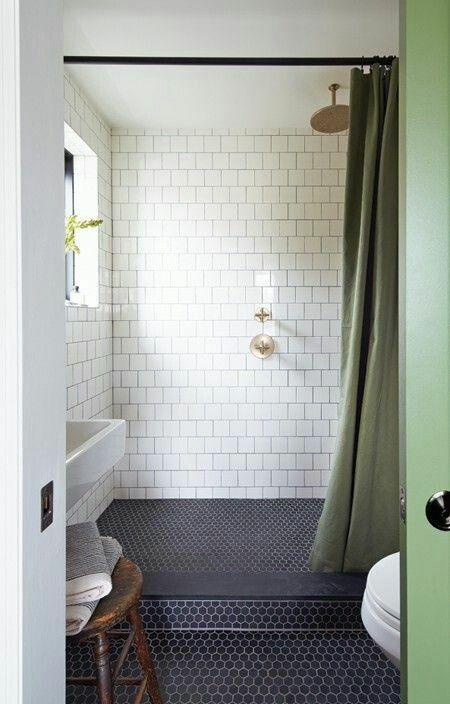 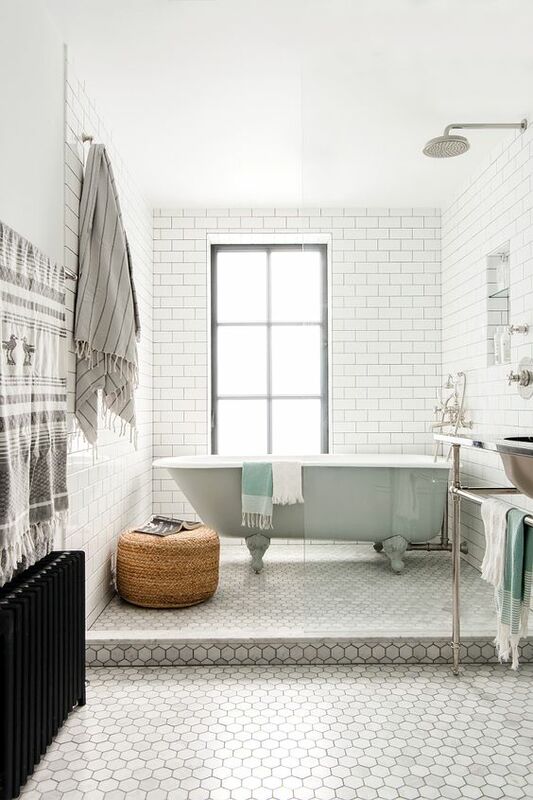 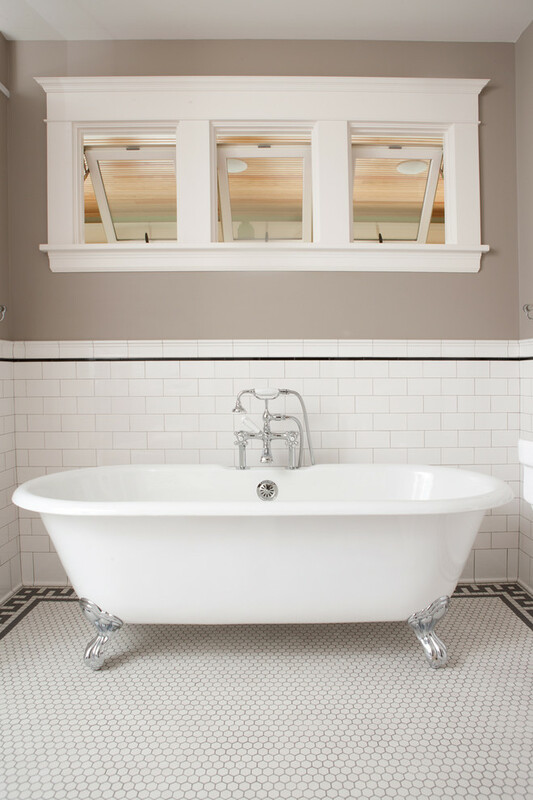 Tiles can be small or large, and the color can highlight the colors of the rest of the bathroom or contrast with them. 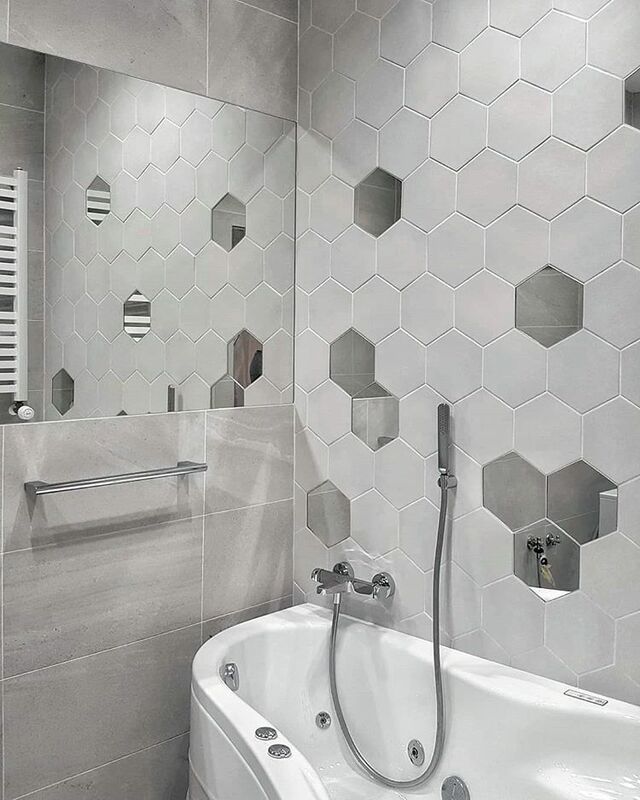 Covering walls with hex tiles is another great idea, and they can also continue the look or contrast with the rest of the bathroom. 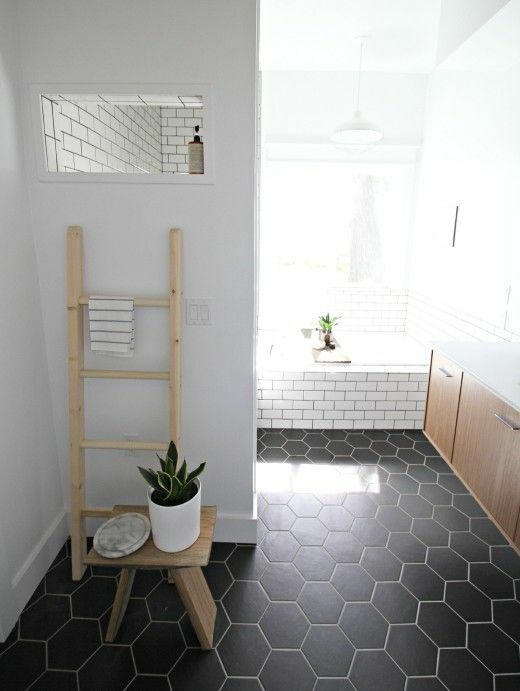 Use hex tiles of some neutral color and floor tiles of the same shades for a peaceful look, or go for hex white tiles on the walls and subway dark ones on the floor. 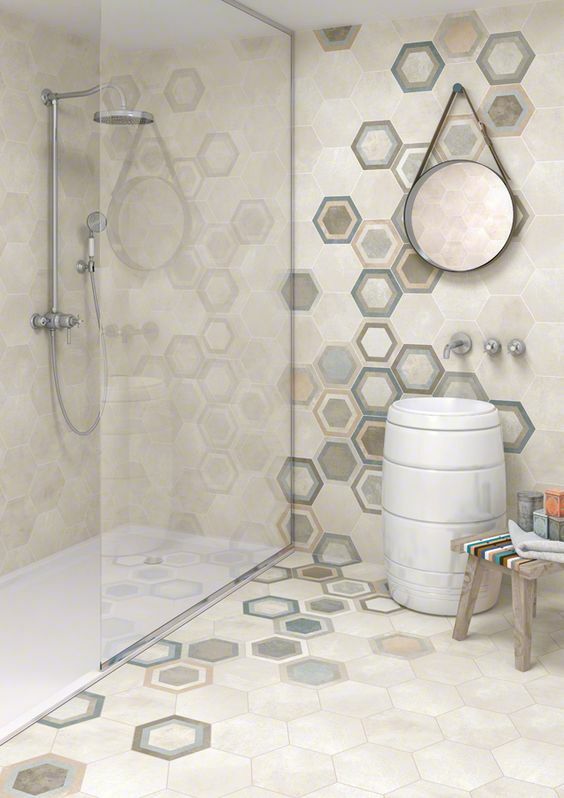 You can also create an adorable mosaics using hex tiles of different colors or a trendy ombre look to make a statement. 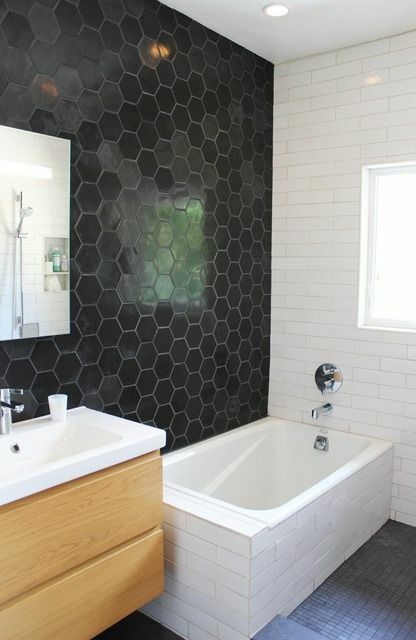 You can highlight the shower or bathtub area with hexagon tiles if the rest of the tiles aren’t hex. 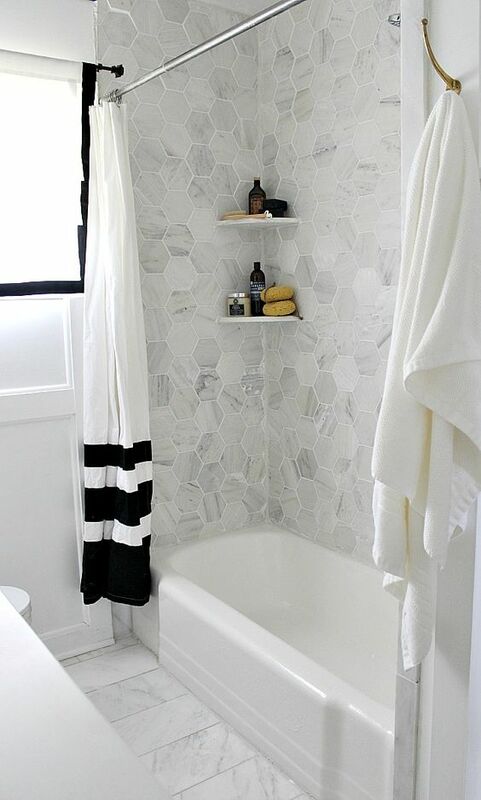 If they are, you can use some different pattern, size or color. 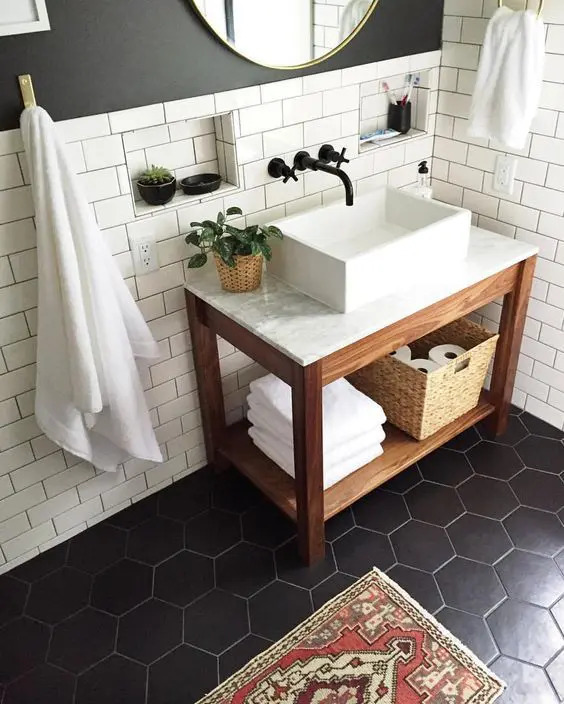 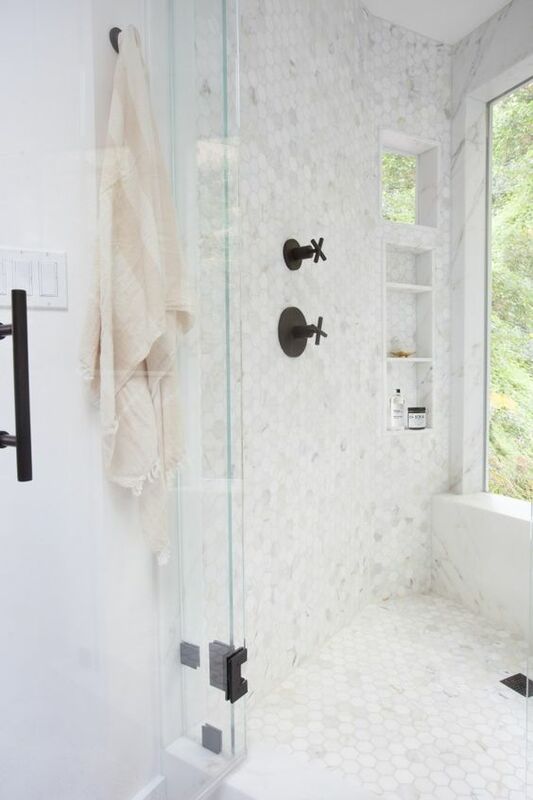 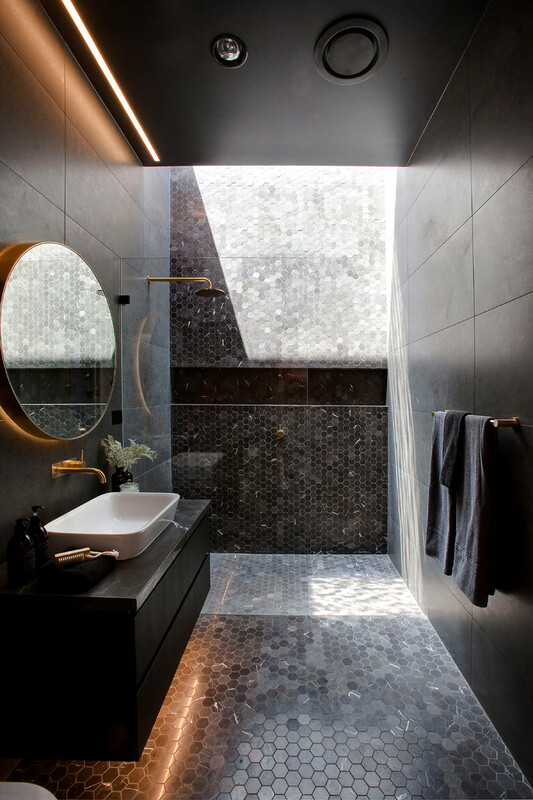 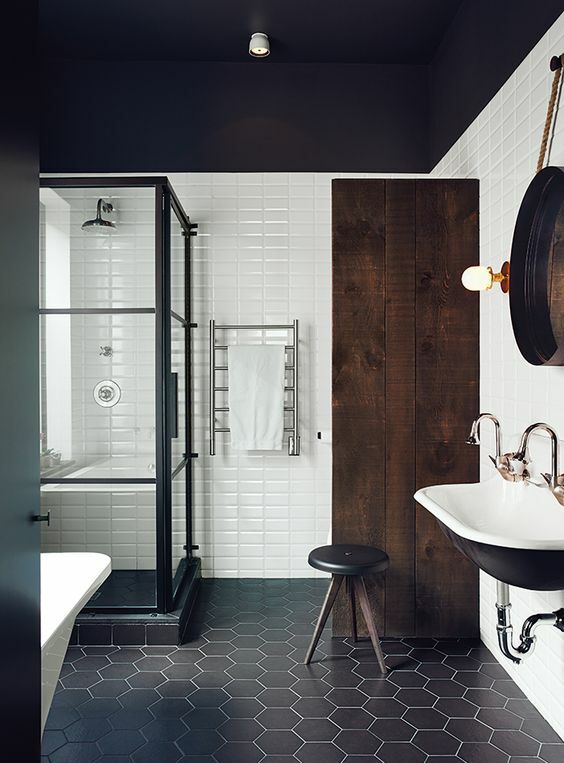 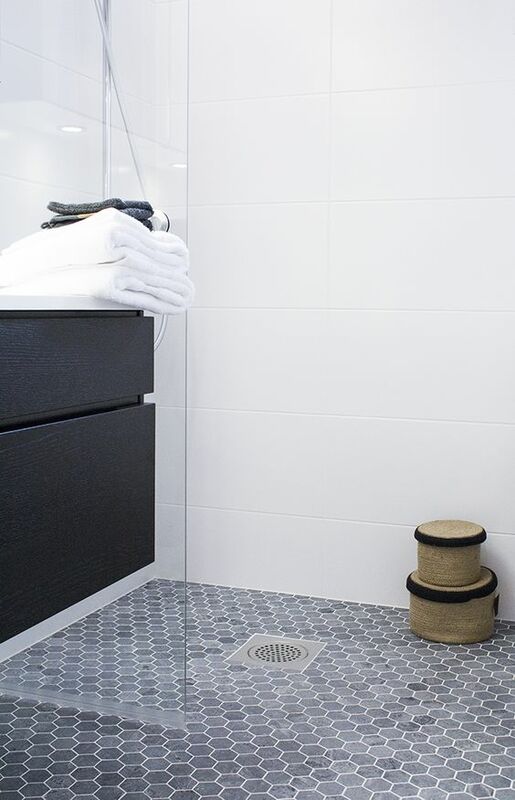 Make the zone stand out using some contrasting grout, for example, black tiles with white grout. 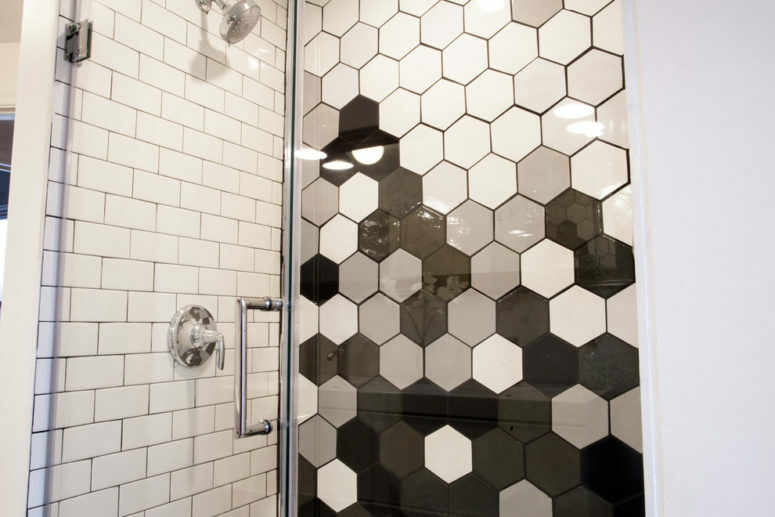 Create a fantastic mosaic of hexagon tiles of different colors and shades to make your shower highlighted. 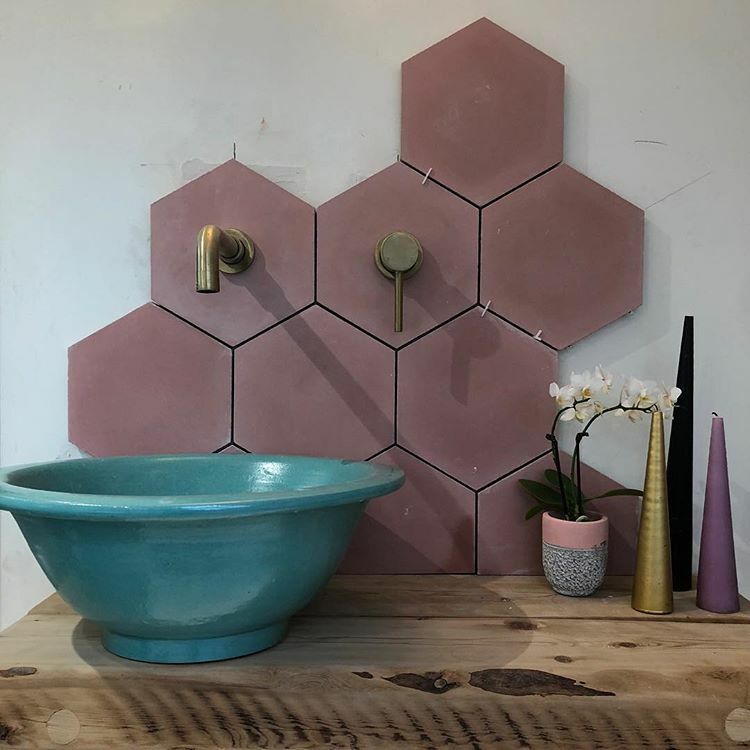 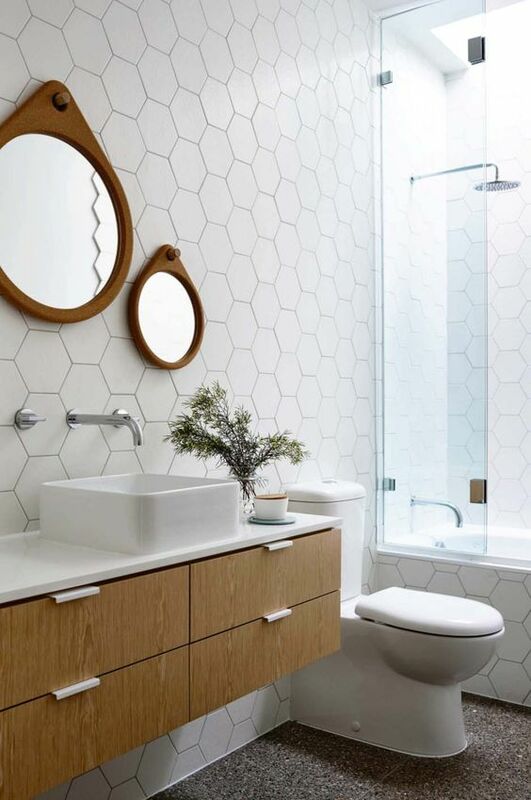 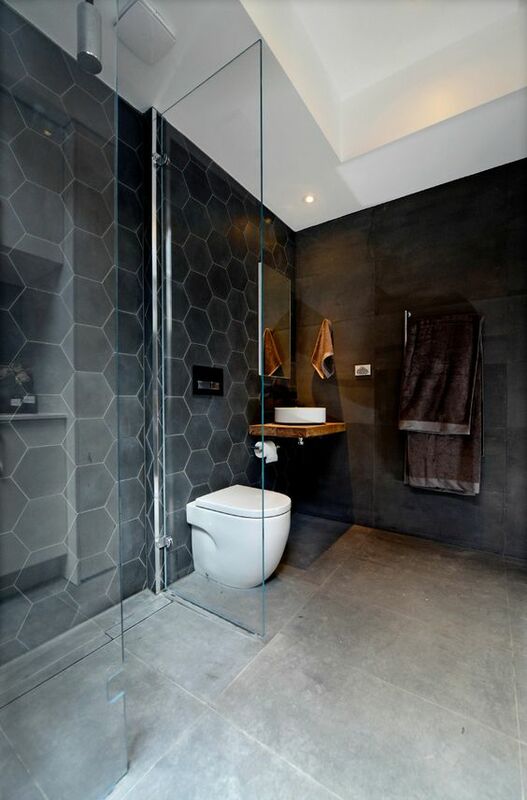 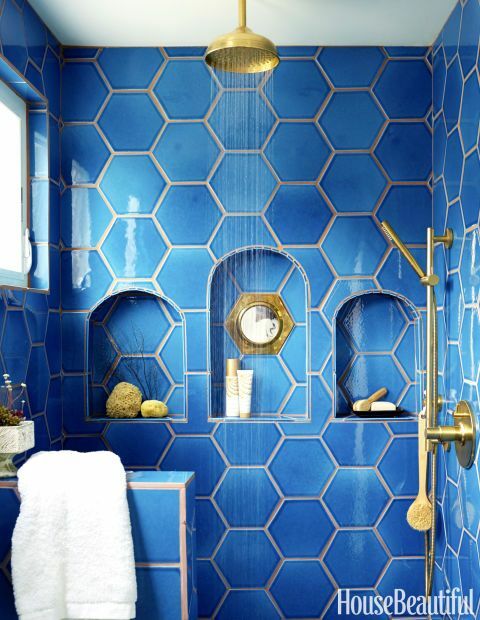 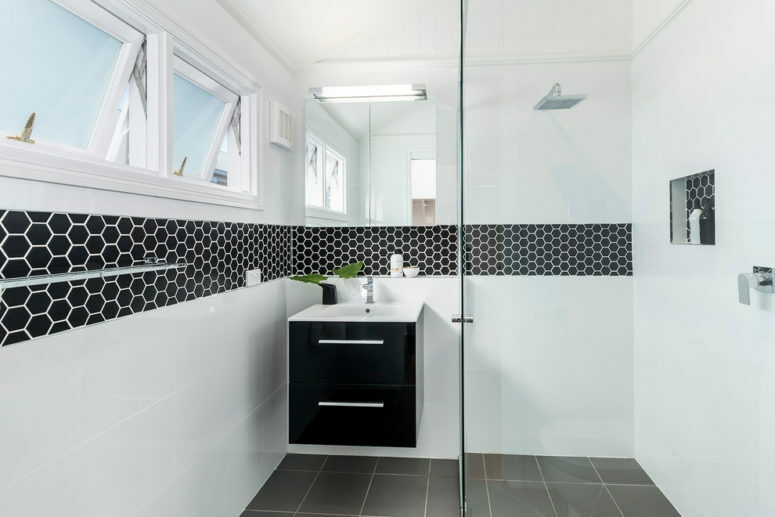 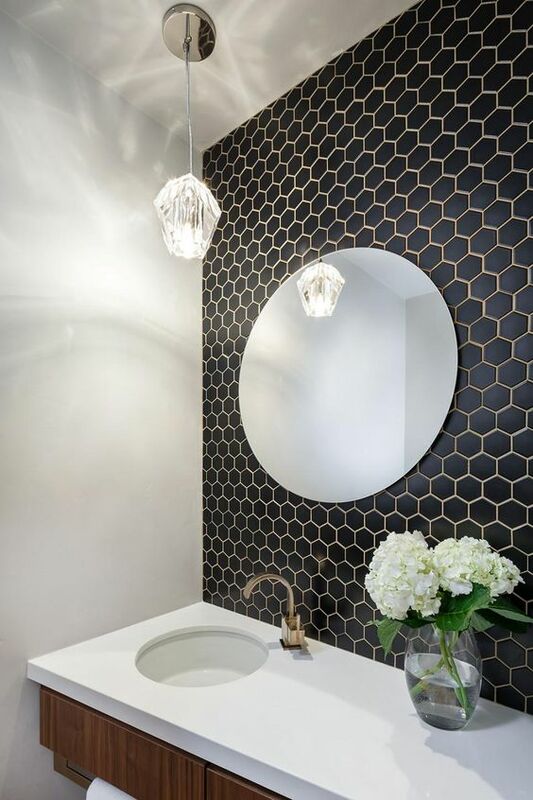 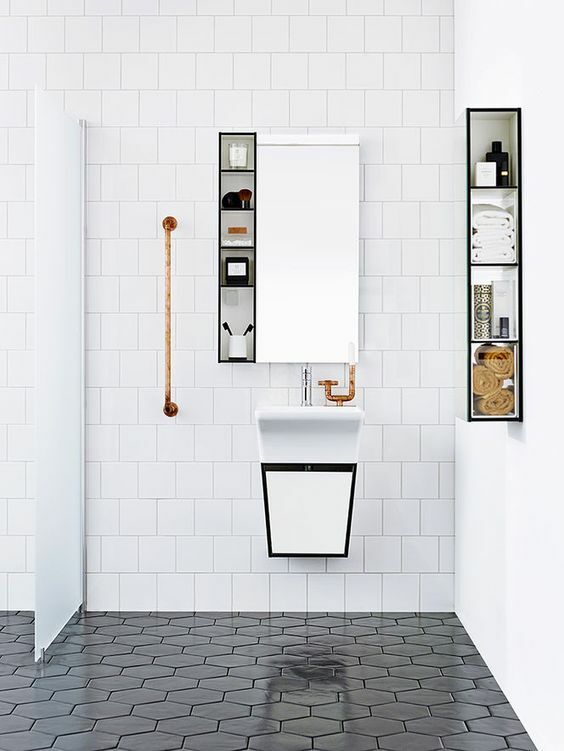 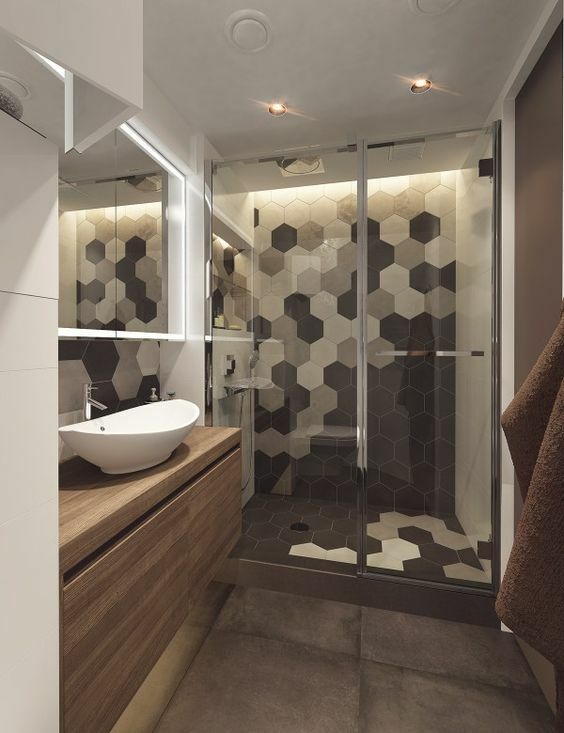 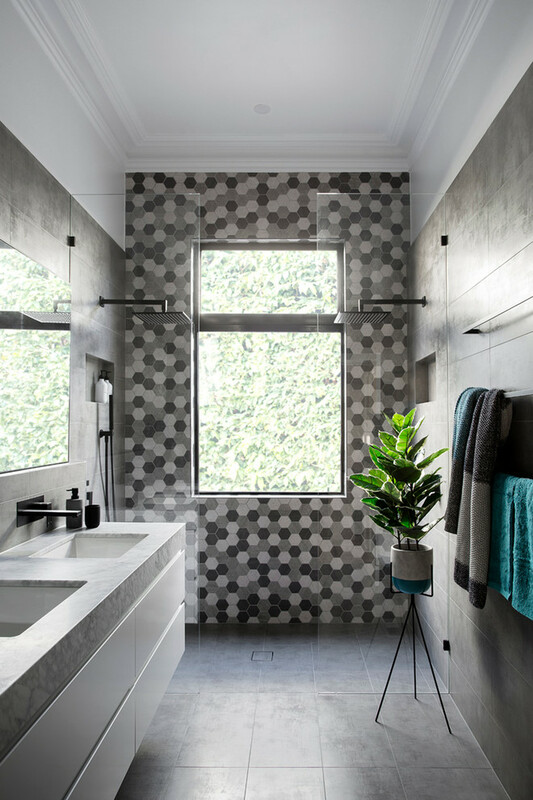 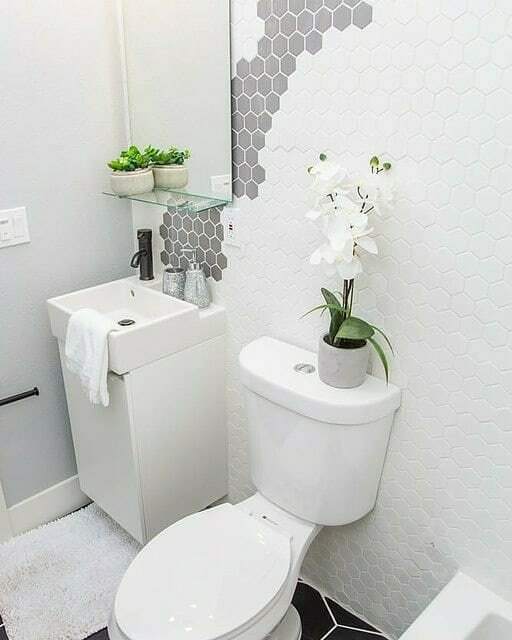 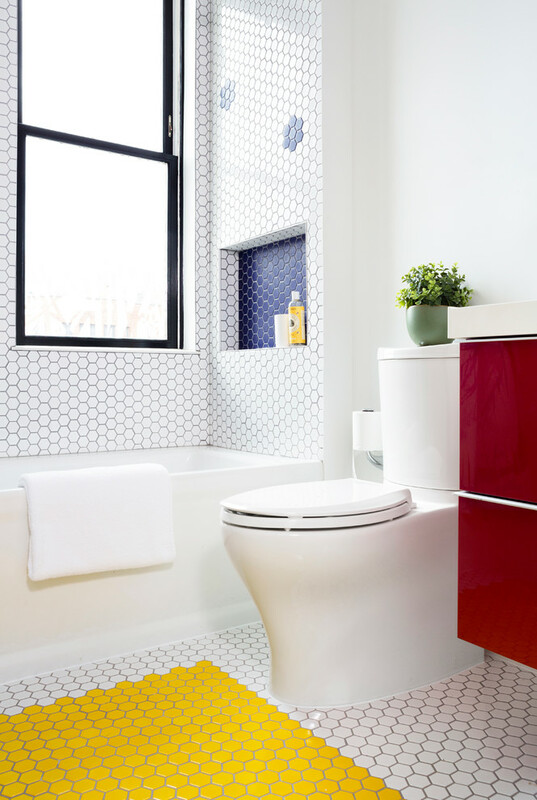 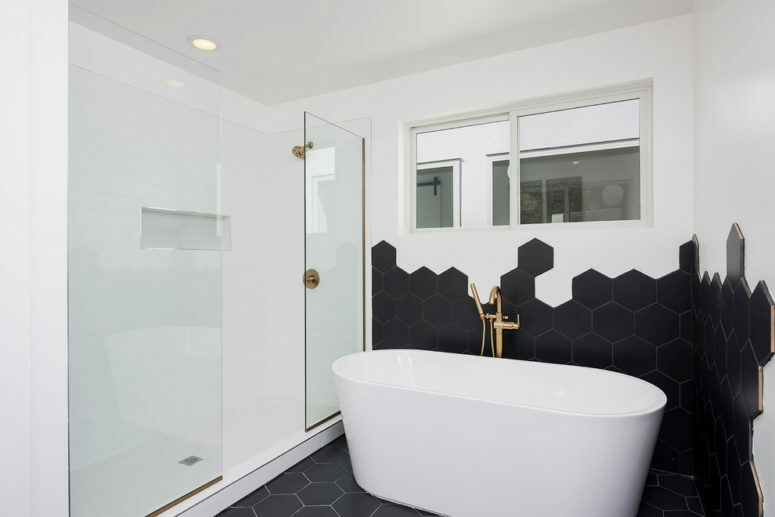 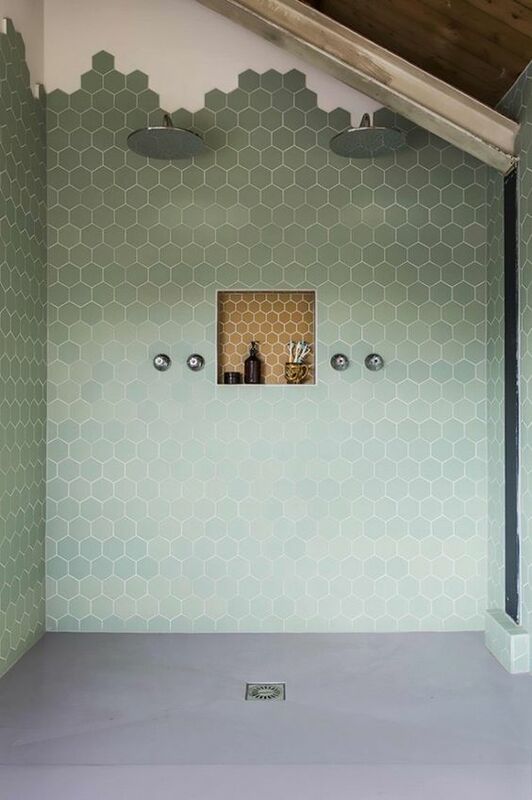 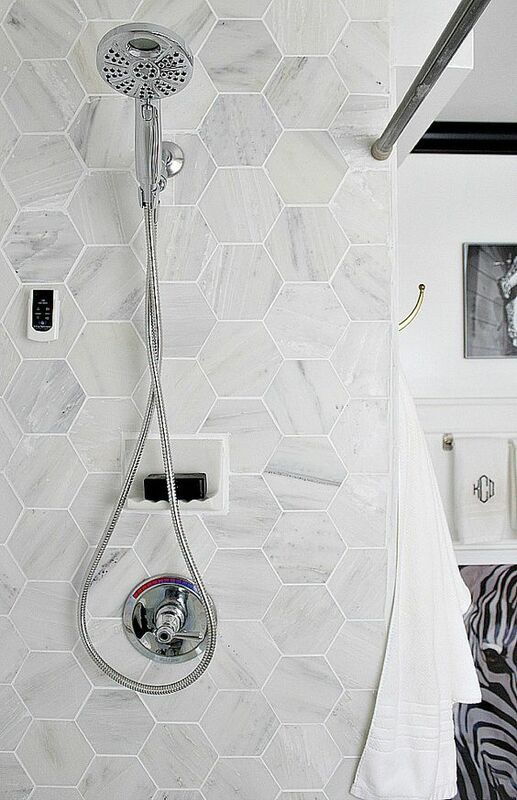 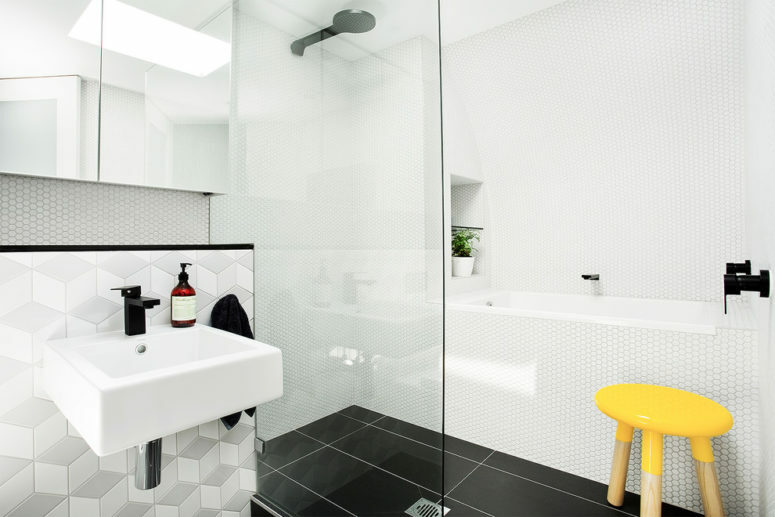 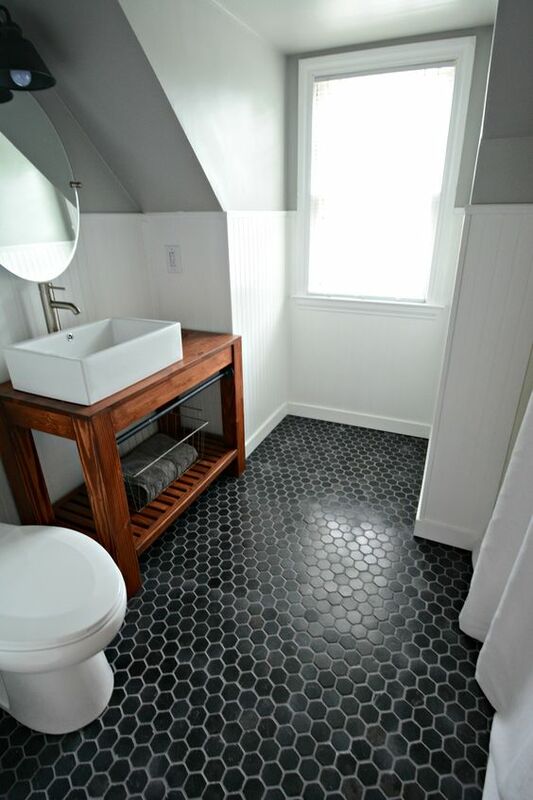 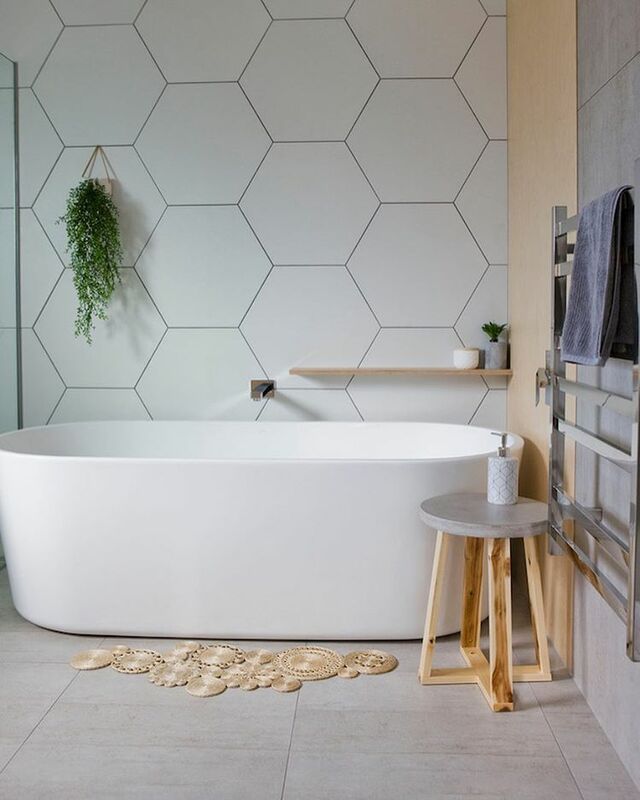 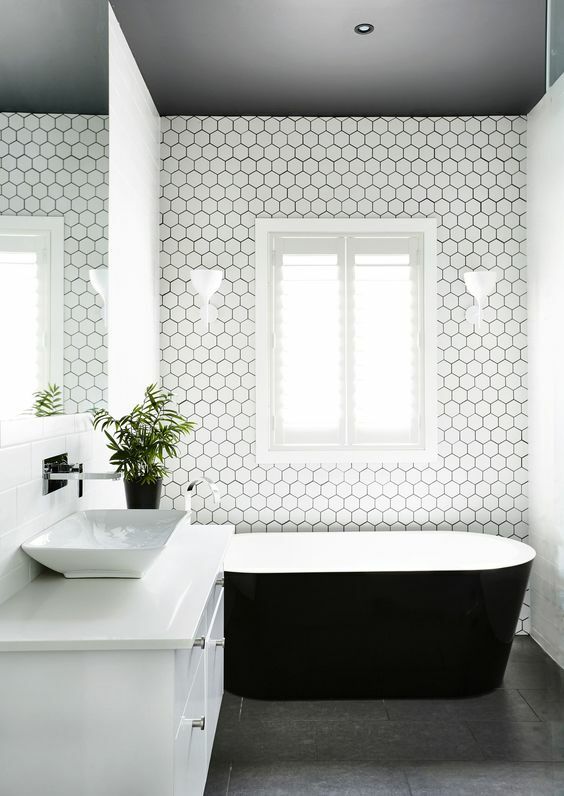 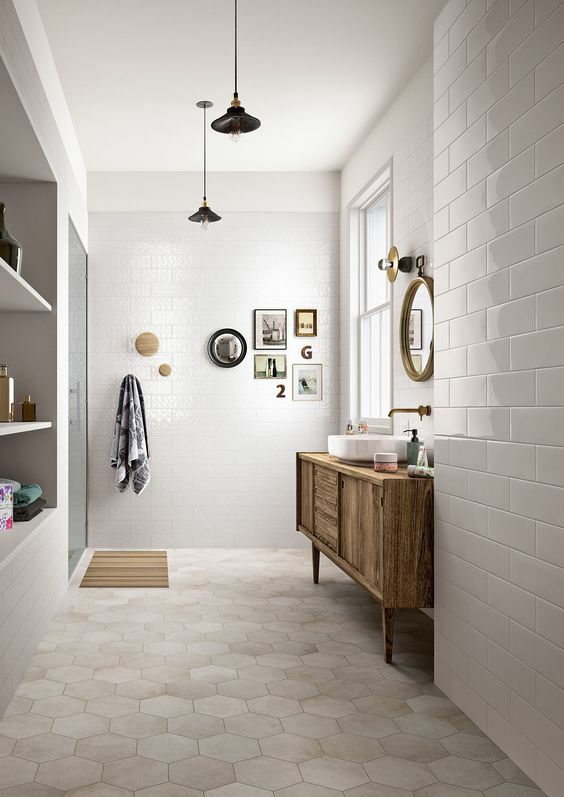 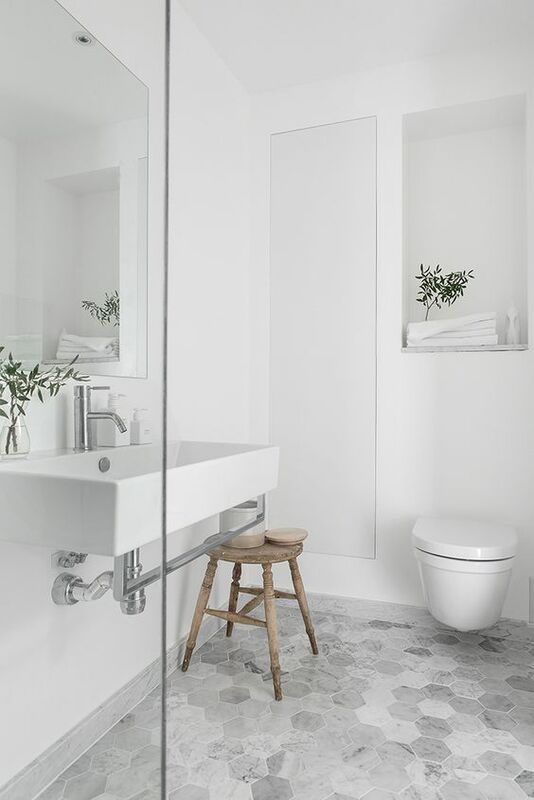 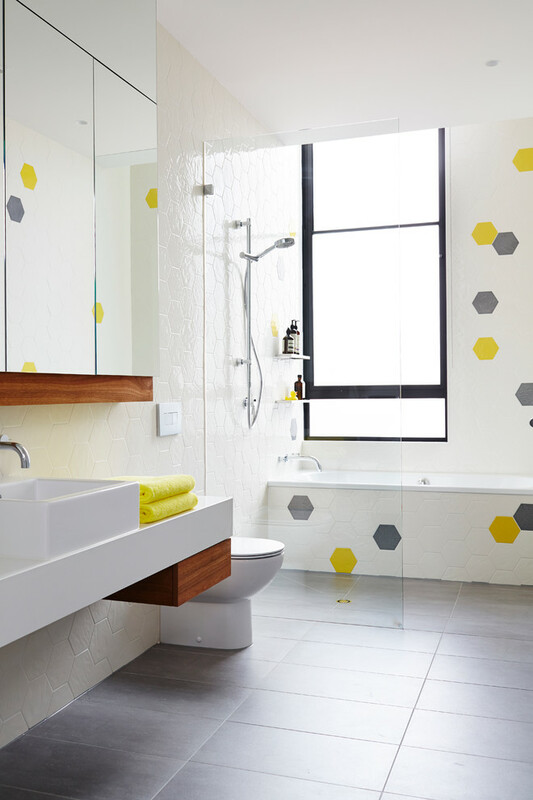 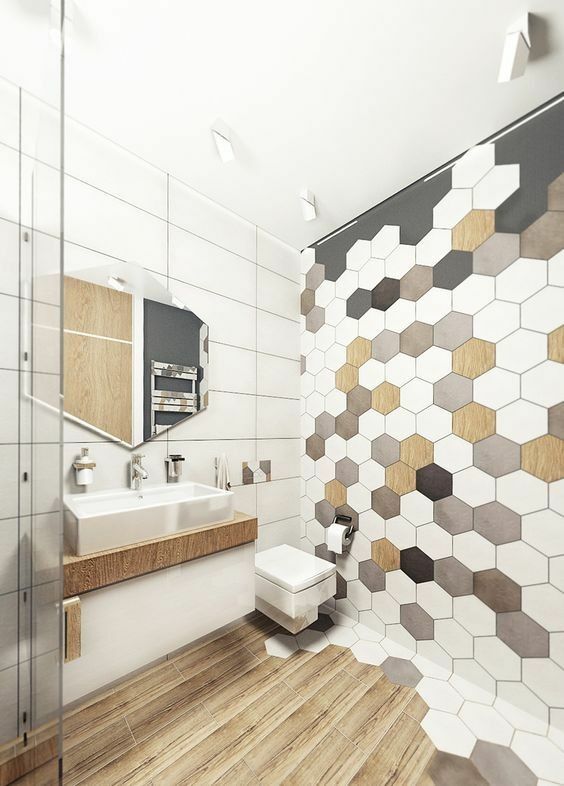 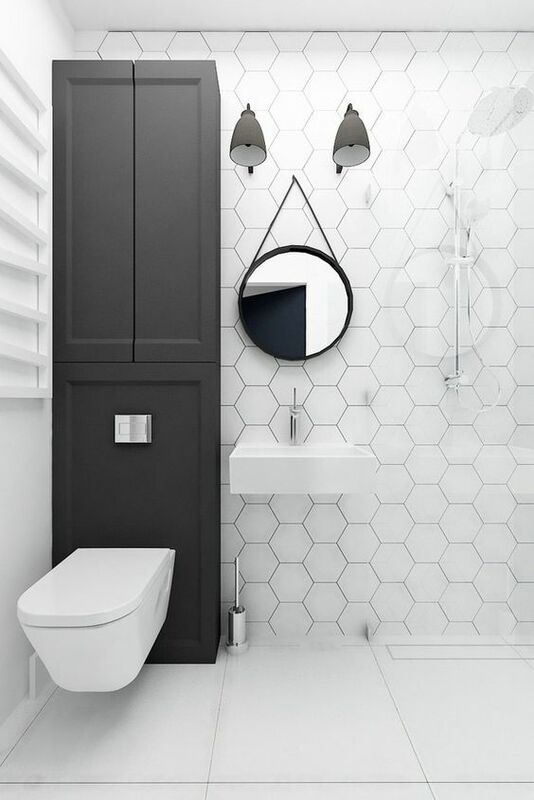 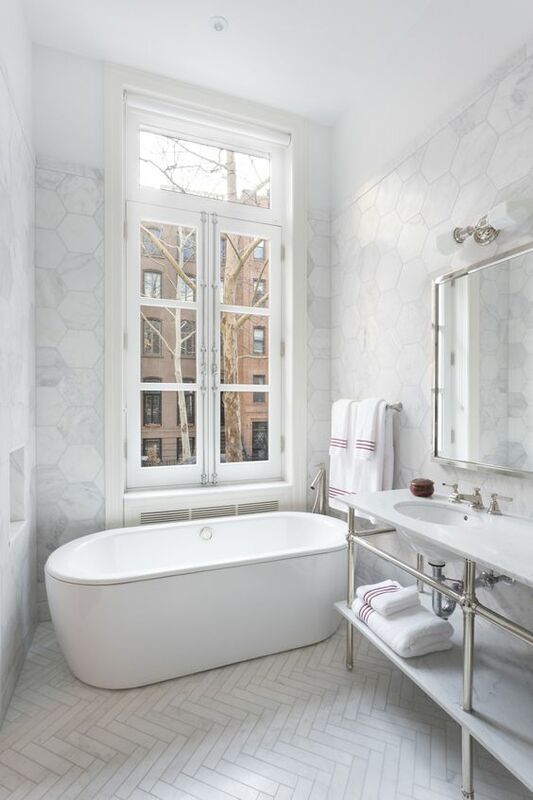 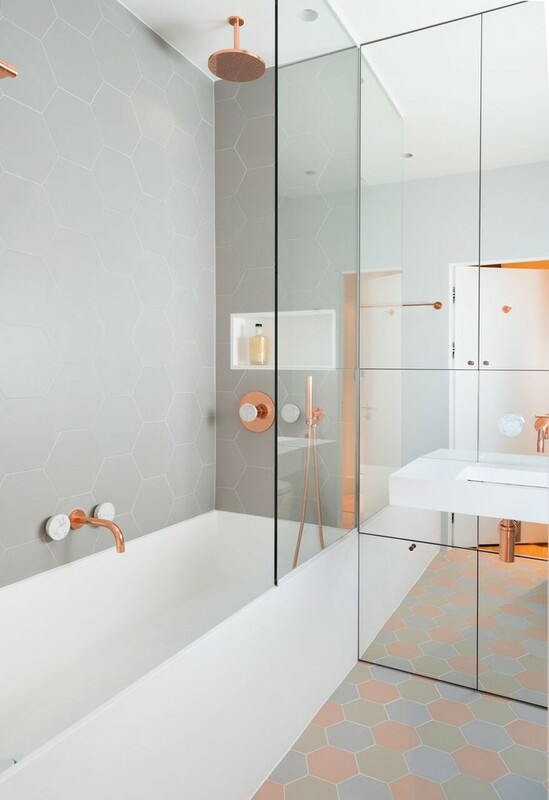 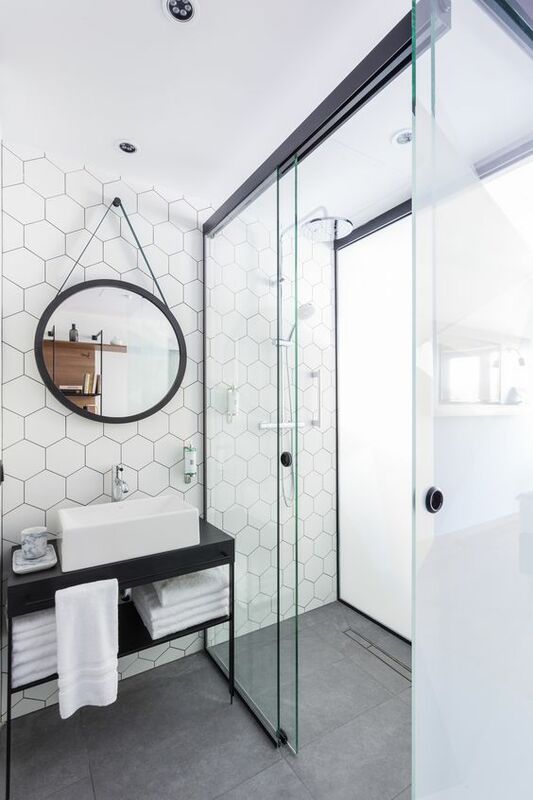 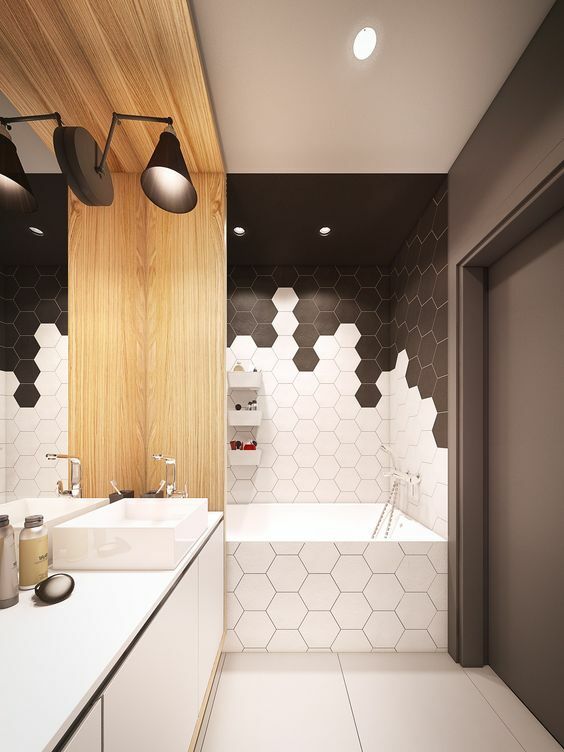 Use hexagon tiles all over your bathroom to get a chic modern look! 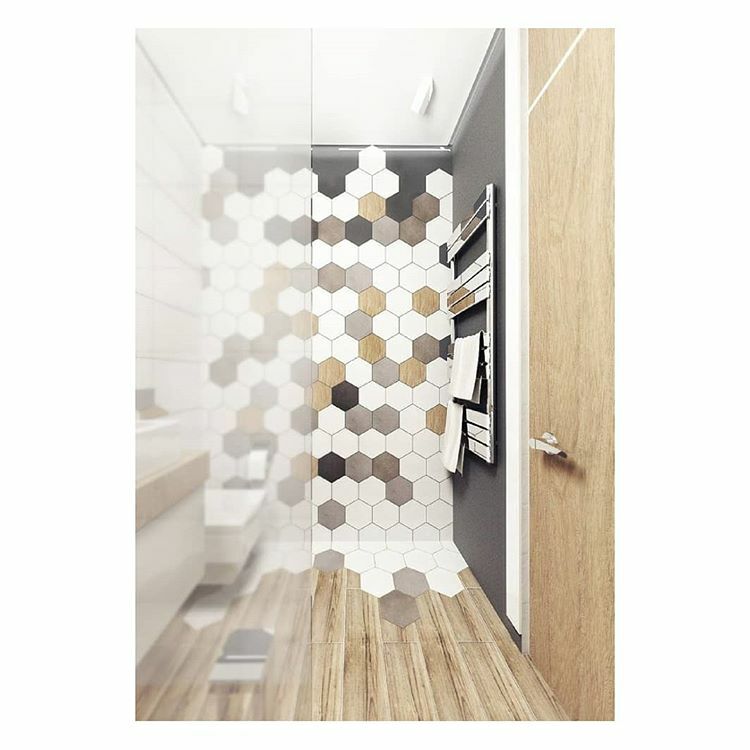 They can be used on the walls and on the floors, or both, just choose different colors and shades. Actually, honeycomb tiles can fit any style depending on the appliances and décor you use.